Posted September 30, 2010 in Uncategorized. One of the only DC Comics I owned as a kid in the 1970s was Mr. Miracle # 1. I just didn’t buy too many DC comics to begin with and never even saw any Kirby DC material until they reprinted New Gods in the 1980s. I think I got this book through a mail order company like Mile High Comics when I bought a special deal on a batch of first issues. I love this cover — I wonder if Jack did the color guide. And here are some examples of great artwork from the story. It seems like Vince Colletta worked a little harder on this book to get the details right as opposed to much of his Thor work. 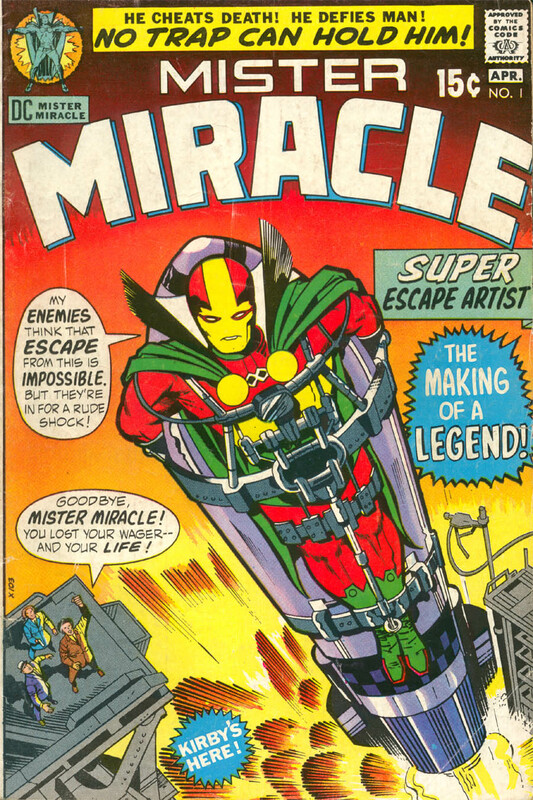 The Mister Miracle character is supposed to be based on Jim Steranko who performed as an illusionist, escape artist, and a close-up magician in nightclubs before going into comics during the late 1960s. 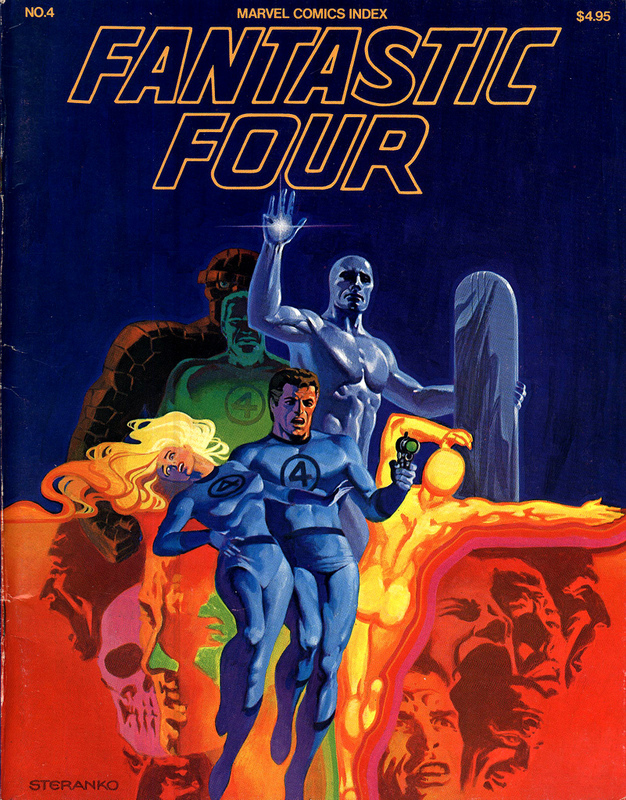 Steranko painted this truly beautiful cover for an early Fantastic Four checklist that I loved as a kid. Posted September 29, 2010 in Uncategorized. 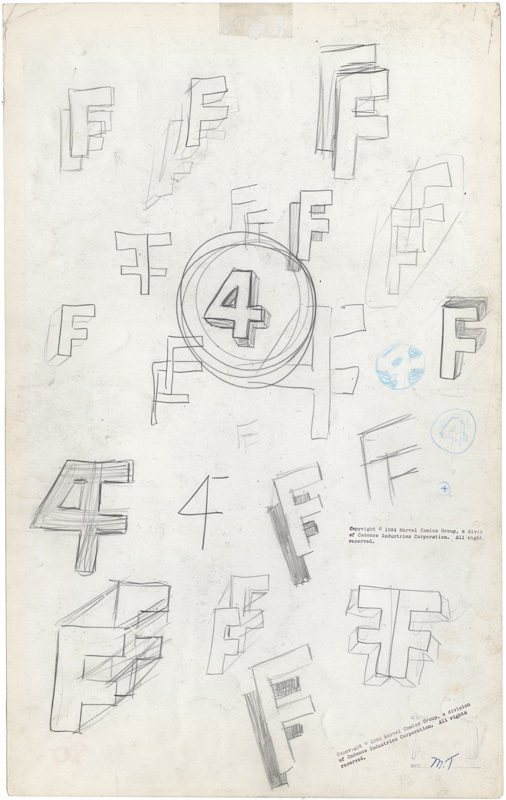 On the back of the page you can see what looks to be the initial designs for the Fantastic Four logo. I find this puzzling for several reasons. 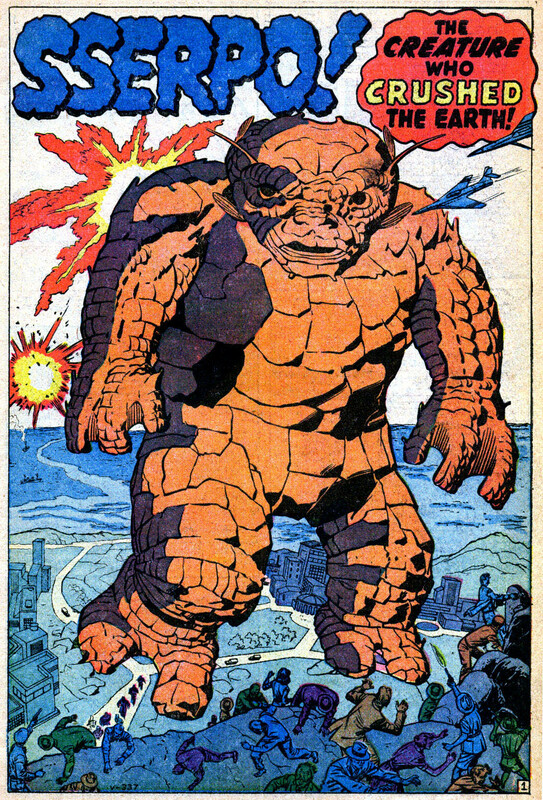 First of all, as far as I’m aware, there are very few examples of Kirby originals where Jack (or anyone else) drew on the back of the artwork — so this is fairly unique. Secondly, this doesn’t really look like Jack’s work to me, and Lee can’t even draw a stick figure, so I don’t know if this is his work either. Also, Jack used his own supplies, and would have turned in the artwork for Lee to dialogue, so Lee would have had to do these logo designs after Jack finished the story. I hate to suggest some monkey business is going on here, but I almost find myself thinking the best explanation for these logos is that they were done after-the-fact. They look almost like someone giving you an indication of what the process might have been like trying to come up with a logo than an actual snapshot of the initial process itself. Why someone would take the time to do this on a back of original art that no one would see is beyond me, but to my eye this is a pretty strange. Then again, looking at page 16, it could be that the “4” logos were added after-the-fact — originally there was no logo and Lee (or someone in production like Sol Brodsky) sketched out those designs on the back of that page, Lee approved the circular logo, and then Sol or someone in the office went through the book and made the changes — adding the 4 logo. I’m pretty sure Greg Theakston has written about this subject before in his Pure Images series, but I don’t have those publications, so if anyone has additional info please feel free to share. Here’s my guess: I think initially there was no logo on the costumes. 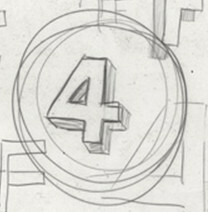 On page 16, Lee decided he wanted a “4” logo, so Lee turned the page over and drew those three “4” sketches that are in blue pencil on the back starting with the smallest on the bottom. Lee gave the page to Sol Brodsky and told Sol he wanted him to add a “4” logo to all the costumes, then Lee directed Brodsky to give him some additional samples. Sol sketched out a few other designs, but the “4” inside a circle was the first one he drew in the center of the page, and he decided it was the strongest, so he circled it. Lee probably green-lighted this design and Sol went through the art and added the logo to the costumes. Of course I haven’t examined all the art from this book closely, so I’m just speculating here, and obviously any number of events could have taken place, so consider this Kirby CSI where I look at what I have, and guess at the chronology and history. 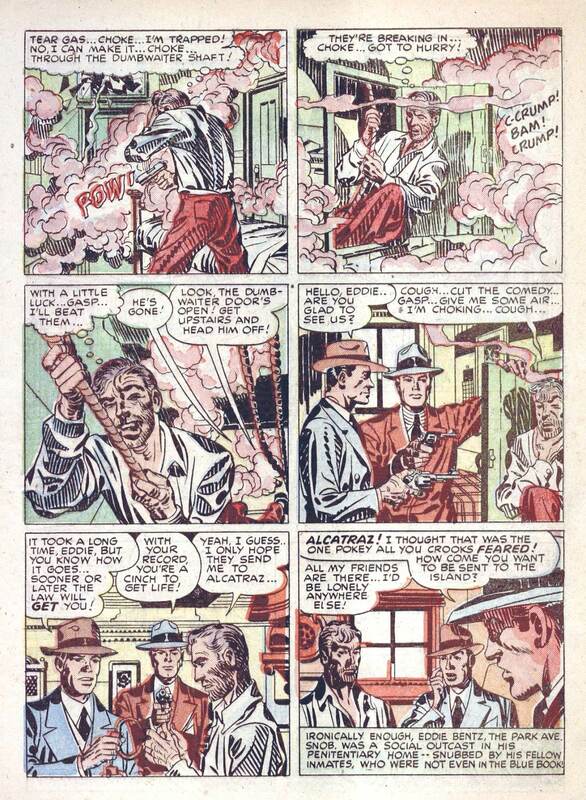 Either way, an interesting look into the Kirby/Lee production process and another fun mystery to ponder. Thanks to Tom Kraft for his great whatifkirby website. Great work Tom. One more observation. The original sketch of the logo has the shadow on the right side. I think the change to the left side is based on the eye’s natural tendency to read left to right. The logo just looks right this way. The characters and action tend to move towards the right and placing the shadow on the left side of the logo enhances this effect. After this issue, you see a mixture of logos in the books that follow: sometimes the shadow is on the left side others it’s on the right; sometimes the shadow is on top of the “4,” other times below it. 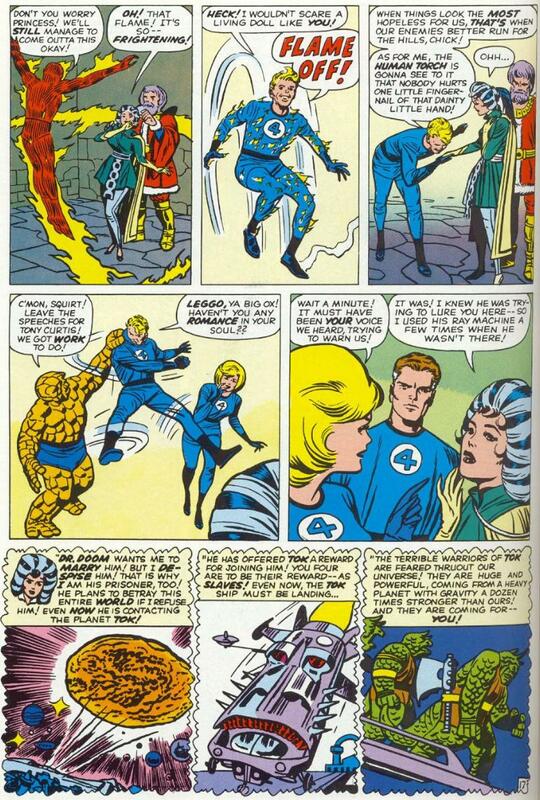 By Fantastic Four # 16 (1963), we start to see a more simplified logo with no shadow at all. 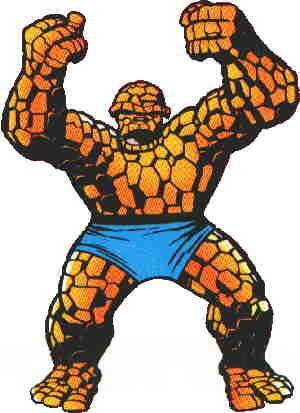 About the Fantastic Four logo, I think Jack once said that he originally envisioned the logo as a 3-D emblem that floated on the costume, and that’s why the shadow was constantly changing in the early issues. I think it’s a neat idea, but I suspect it was probably an annoying thing for Jack to have to draw constantly, so he eventually went to the flat logo. Good luck to Kris. I hope he has as much fun as I’ve had here at Kirby Dynamics. Posted September 28, 2010 in Uncategorized. One of the fun things about studying the life and work of Jack Kirby is that I’m always stumbling upon things I’ve never seen before. 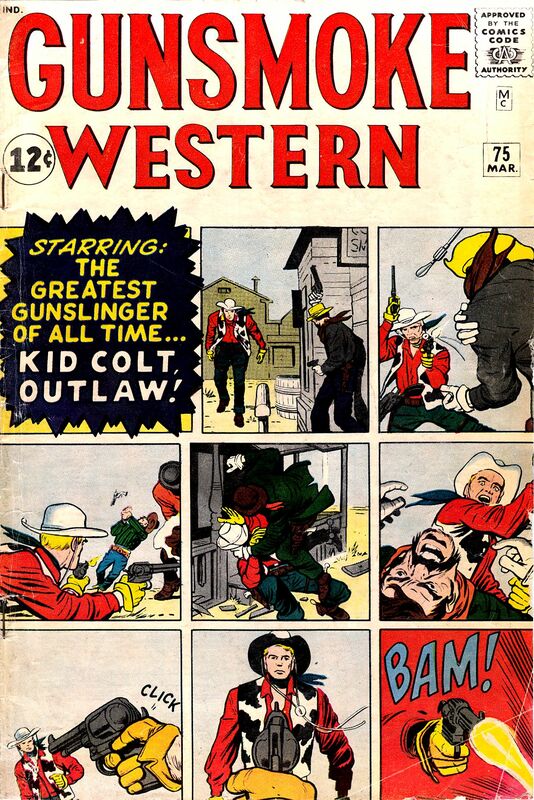 For example, here is the cover to an obscure title called Gunsmoke Western# 75 (March 1963) Kirby/Ayers. Wonderful example of using a comics grid as a cover. I honestly don’t ever recall seeing this approach before on a comic cover before, although I’m sure comics experts can think of other examples. 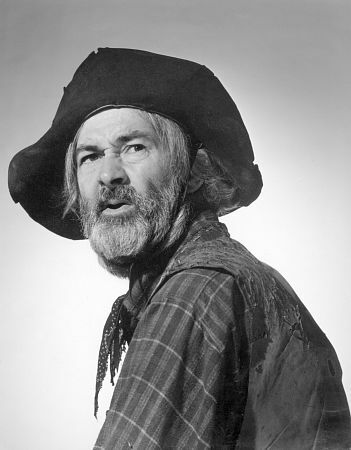 It’s remarkable that TV, movie, and apparently comic book Westerns were popular for decades, then in the 1960s the genre just seemed to die all of a sudden. It looks like this cover might have originally been an interior page. 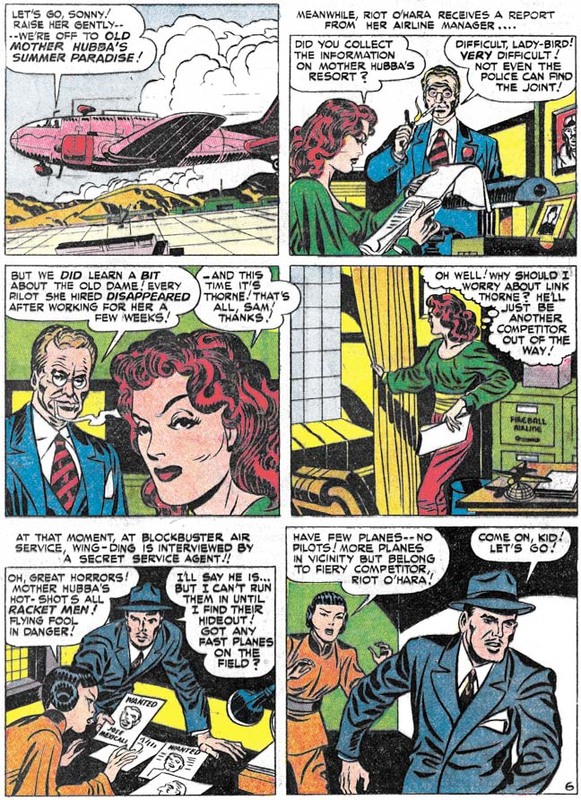 Notice the blank space especially at the top of panels 2, 4, 6, and 7 — that’s where Jack left room for editor Stan Lee to add captions. It’s a great action page, so I can’t imagine why Lee would have rejected it, but it does look like a cannibalized page to me. I’ll go ahead and try my hand at Stan’s job and see if I can dialogue this page in a about 30 seconds. Please feel free to play along at home. Panel 2. The Bad Guy (thought balloon): HAHAHA!!! THE KID CAN’T SEE ME BEHIND THIS BUILDING — I’LL FILL ‘IM FULL’A LEAD!!! Panel 3. The Kid (thought balloon): I’LL SHOOT HIM IN THE ARM SO HE CAN FACE A JURY AND GET A PROPER TRIAL!!! Panel 4. The Kid: TAKE THAT YOU MANGY VARMITS!!! (thought balloon) I’LL SHOOT THE GUN OUT OF HIS HAND SO HE’LL BE ALIVE TO FACE AN HONEST HANGIN’!!! (sound effects) BRAMP! BWAMP! Panel 5. Bad Guy: HAH!! YOU DIDN’T SEE ME HIDING BEHIND THIS BUILDING DID YOU??!! (thought balloon) I’LL PUNCH HIM IN THE FACE A BUNCH OF TIMES!!! (sound effects) WAP! BAP! Panel 6. The Kid (thought balloon) NO NEED TO WASTE AMMUNITION ON THIS MONGREL — I’LL JUST GIVE HIM A FIST SANDWICH!!!! (sound effect) KABLOOWIE!!! Panel 7. Bad Guy: I GOT YOU IN MY SIGHTS KID!!!! AIN’T NO ESCAPE!!! SAY YER PRAYERS KEMOSABE!!! Panel 8. 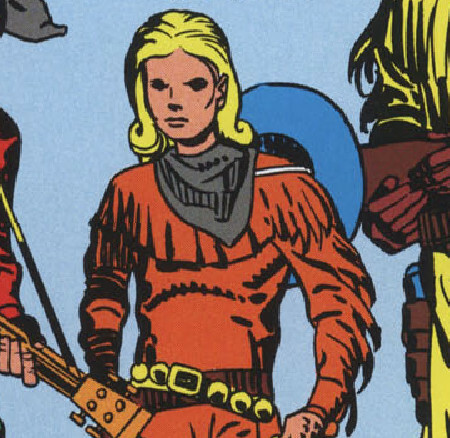 The Kid (thought balloon): HEE-HEE, WHEN THAT IDIOT REALIZES I SWITCHED OUT THE BULLETS IN HIS GUN WITH STICKS OF DYNAMITE HE SHORE ‘NUFF GONNA BE IN FER A BEEEEEEEG SUUUUPRISE!!! Panel 9. Bad Guy: AAAAARGGGHHH!!!! Posted September 27, 2010 in Uncategorized. A bunch of people have asked me this question (below), so I figured I’d post my reply here. Plus I might start posting more reader comments, so if any of you have any thoughts on Jack’s life and work, please send them in. Just a quick question about your Kirby Dynamics blog: How come you always have the comments off? It’s a blog! Don’t you want to hear from your fellow Kirbyheads? Wait, don’t answer that! Maybe it’s better to let the other blog hosts take all our fannish abuse. I have the comments off for a bunch of reasons. I’d rather weave comments into the narrative so people actually read them. 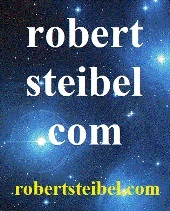 I figure if somebody really has something to say they can email me at robsteibel@yahoo.com and I can post their comments in a new post. Mainly I just find most comments in those little comment boxes on other blogs distracting and annoying — y’know stuff like “w000 hOO kiRBY wAS GRATE!! 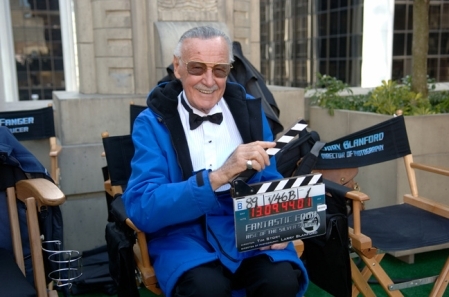 !” or “STan LEE is a $%$@ &#%$.” That sort of thing. I’d rather have readers focus on Jack’s artwork than drama in the comment boxes. I might turn on the comments option at some point but I’m having so much fun doing it like this I figure why change my approach. I appreciate you checking out the weblog. Thanks for the feedback. I wanted to comment on your post on X-Men #17. 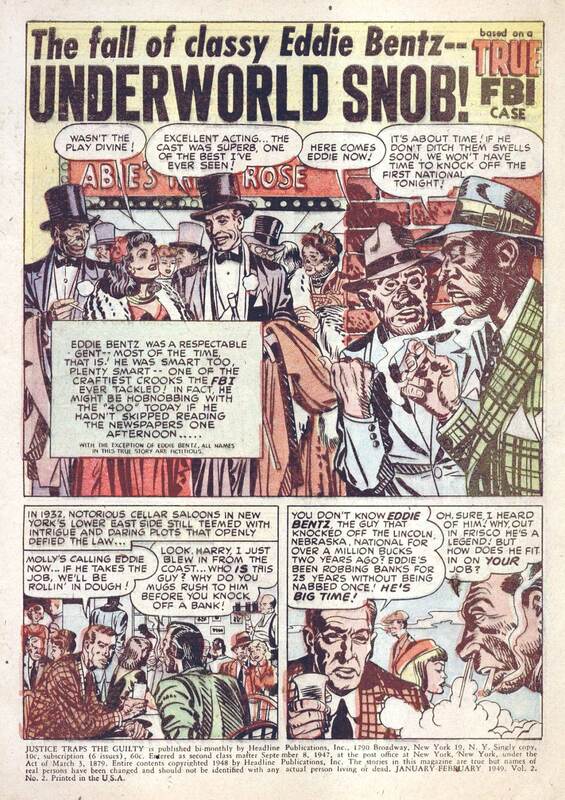 I agree that Jack put a lot into that 1st page splash… I see little, if any Werner Roth on that page. Looking at the faces of the medics, the cop, the Beast… pure Kirby. 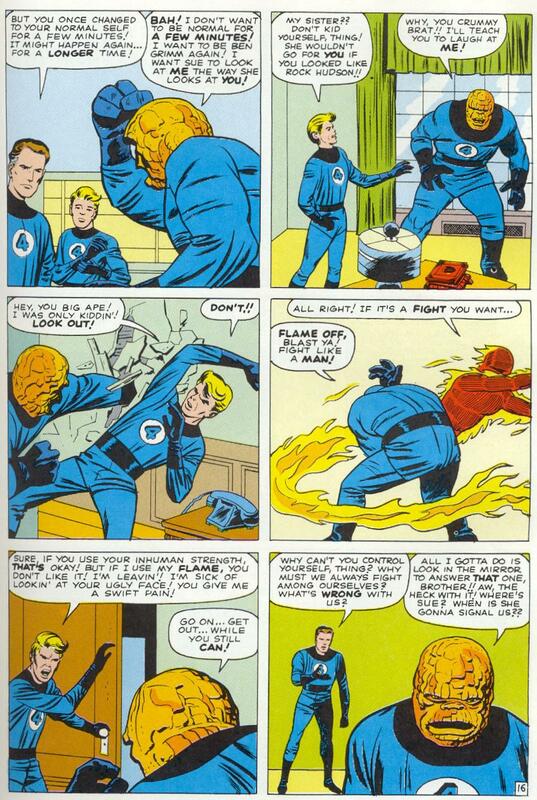 the beast’s outstretched hand… a classic Kirby hand. In Boy’s Ranch, Kirby would often do the splash and then another artist would do the remainder of the story, so there’s a precedent for this. 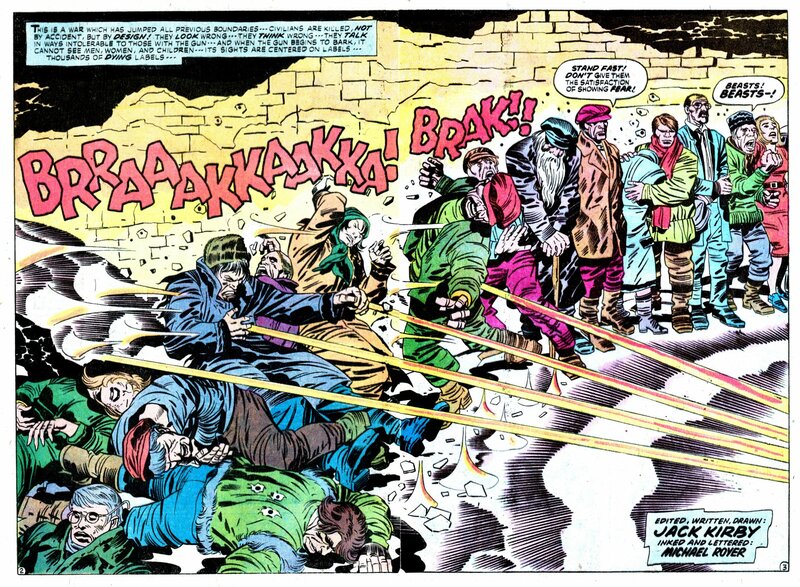 I think Jack pencilled the X-Men splash tightly enough that Werner Roth had no reason to add much of anything to it. Thanks Glen. Great observations. Eventually I hope to take a close look at some of the stories where Jack is credited as the layout artist and explore how Jack’s dynamics were filtered through the second penciler then the inker. Finally, here’s something I plan to talk about a lot more in the future when I have more time to do the subject justice, I emailed Joe Sinnott’s son Mark about a month ago or so and asked him: How many pages did Joe ink a day during the 1960s, and about how many hours did he spend on each page? Joe worked 8 hours every day (no more than 8), and could ink 2 or 3 complete pages of Kirby pencils, depending on the page. If there were alot of mechanical drawings or buildings etc., he could ink 2. If it was alot of characters etc. he could ink 3. Thanks Rob. Hope all is well. Thanks to you Mark, and to your Dad who in my opinion is unquestionably the greatest comics inker of all time. Just a terrific craftsman and a wonderful person. I’m going to talk a lot more about Joe’s extraordinary craftsmanship and work-ethic in the future. 9/19 – Friday’s surgery went well. Joe’s doing fine! 9/26 – Rehab & PT going well – getting better each day! 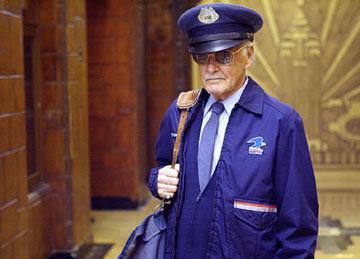 Best wishes to the great Joe Sinnott, and thanks to all of you for your emails. 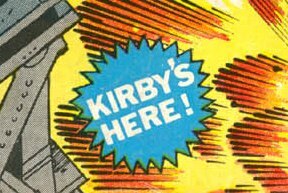 That’s a wrap for the first episode of Kirby Dynamics Mailbag. Posted September 26, 2010 in Uncategorized. 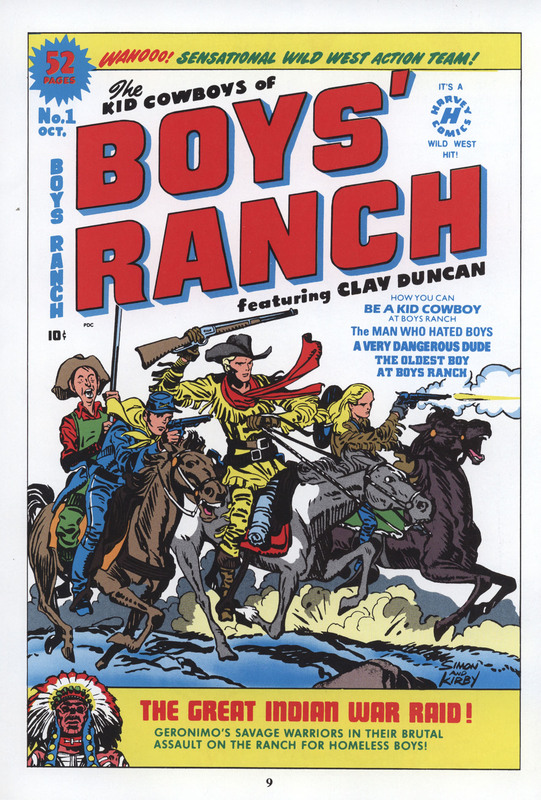 At this time I don’t have any scans from original Boys Ranch books, so I’ll pull a few from the Marvel Boys Ranch hardcover reprint collection from 1991. Here are the first 3 pages in the publication: the original cover for the first appearance of the Boys Ranch; a truly stunning splash of an Indian chief; and an introduction to the characters. Too bad Jack wasn’t asked to do more text pieces. I enjoy reading his take on the stories, art, and characters he created. 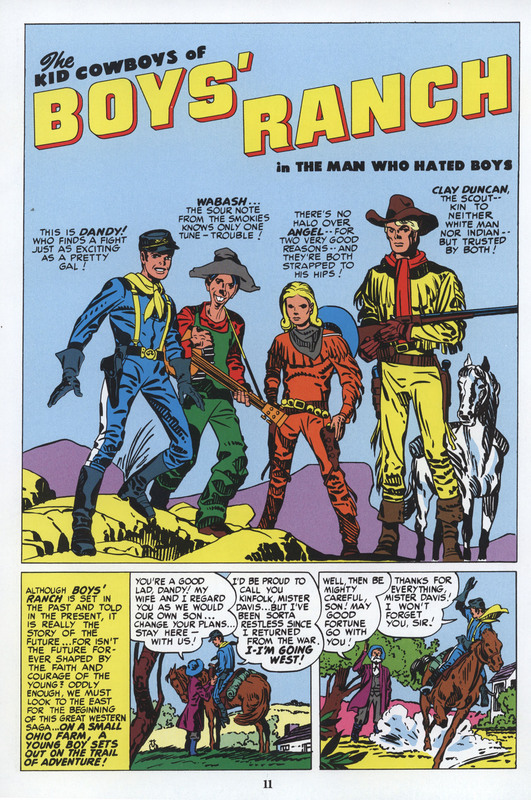 Great composition in the Boys Ranch cover where the adult is in between the union kid and rebel kid visually mediating the opposing forces, then you see the comic relief character bringing up the rear: Wabash, a kind of kid version of Gabby Hayes. 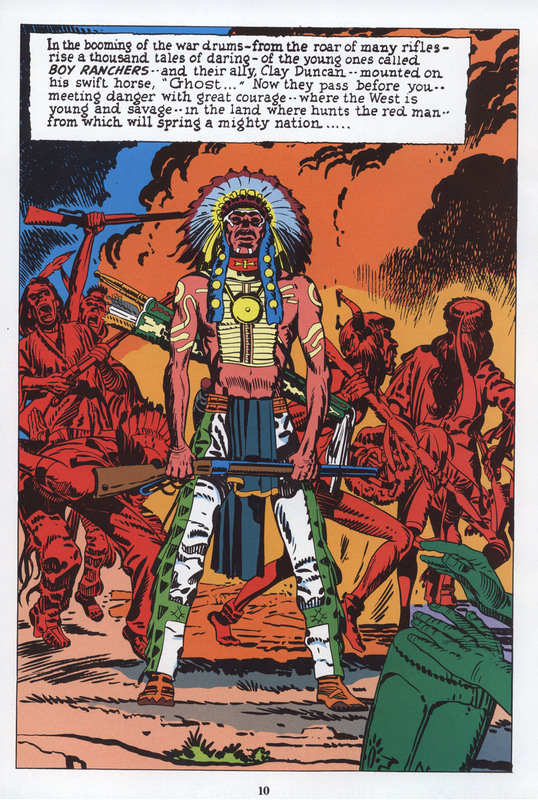 Appears a paste-up of the Indian was used in the bottom, left corner of the cover. Great touch by Kirby having the hands pounding on the drum in the right corner of the splash below. 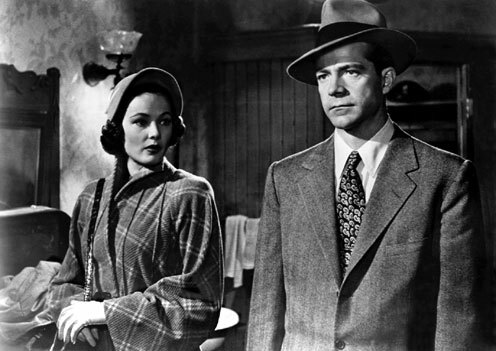 Probably kind of sad that today many might misconstrue an adopted family relationship between a man and three young boys as potentially inappropriate, but at the same time a symbol of the innocence and idealism of the era Jack grew up in where men could be mentor figures for young boys without rumors of homosexuality being an issue. 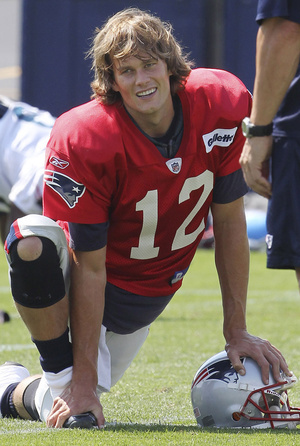 Angel’s hairstyle looks a little like the “do” New England Patriot’s quarterback Tom Brady is taking a lot of heat for. 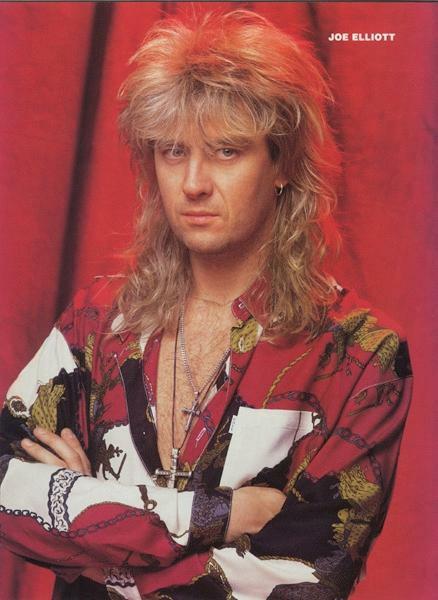 Or how about Def Leppard frontman Joe Elliot circa the 1980s. Posted September 25, 2010 in Uncategorized. 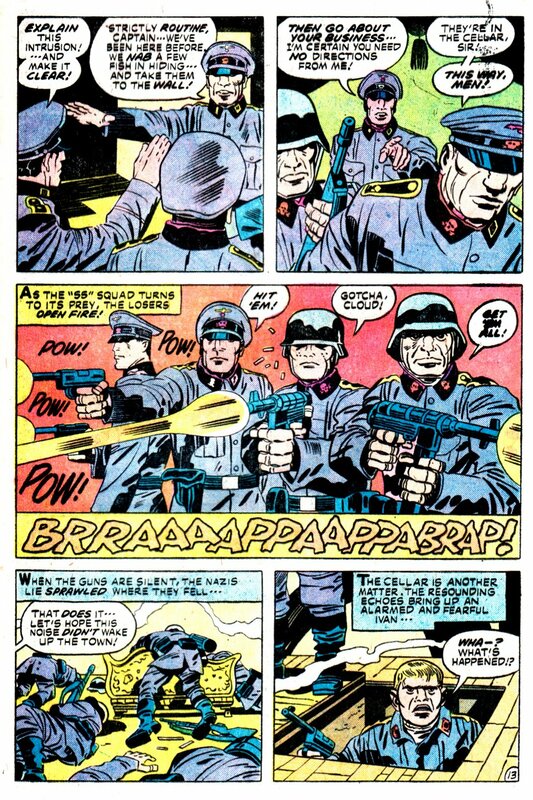 Some very violent imagery, considering the strict comics code, from Our Fighting Forces # 160, no doubt depicting the ferocity and brutality of warfare reflecting Jack’s own experiences fighting the Nazis. A double-splash page, followed by pages 13 and 14. Inks by D. Bruce Berry. The first image is especially ferocious. No need for stereotypical blood and guts, the composition of the image alone says enough. Posted September 24, 2010 in Uncategorized. 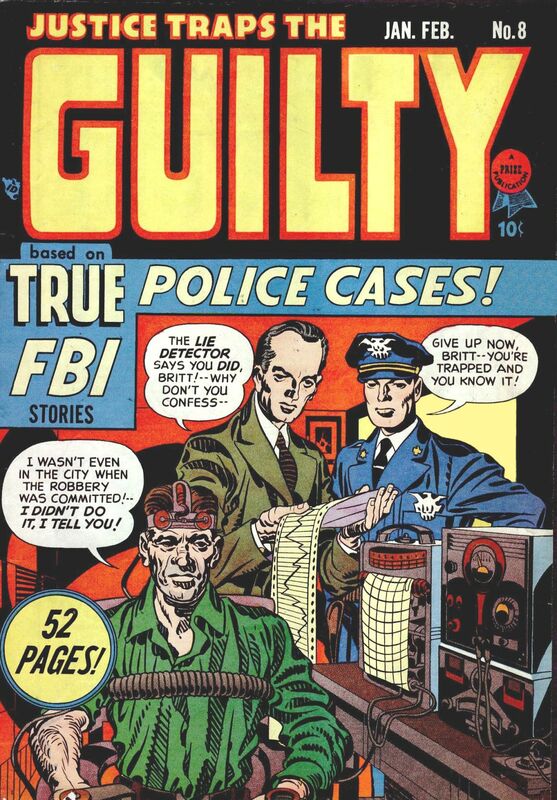 I finally got some nice scans of some late-40s Kirby crime comics so here is the cover of Justice Traps the Guilty # 8 (Jan 1949). 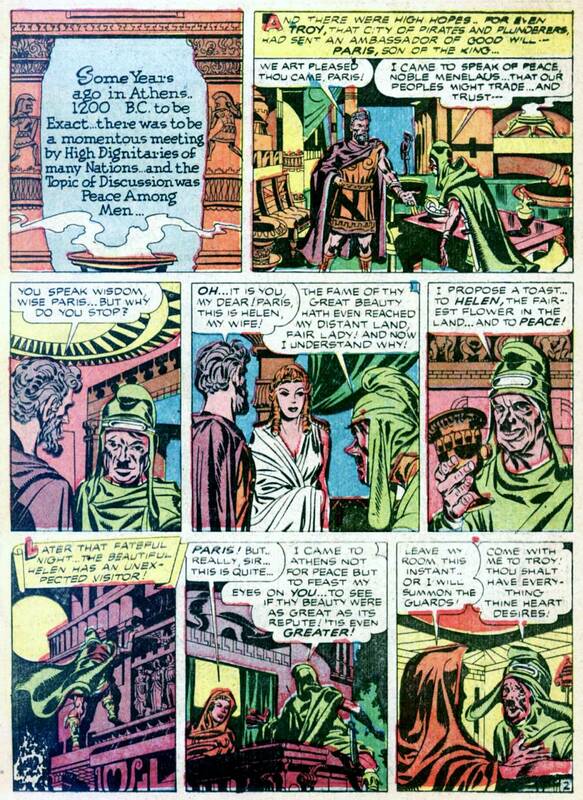 The Jack Kirby Checklist credits the inks to Kirby, and all I can say is: wow. I love the inside of the eyes on all three main characters — all black, where there is no differentiation between iris and pupil. Reminiscent of a photograph where the pixels have blurred together. I wonder if Jack consulted any photo reference for this image. I also like the parallel-line shading done with a brush. Lots of line-variety on those lines — perfect style for a gritty, moody piece. Funny that all the characters are talking, but nobody’s mouth is open. 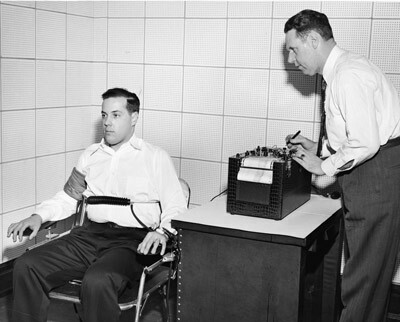 Also note Jack’s lie-detector. Fairly realistic looking. I’d guess maybe Jack used some reference — it’s not nearly as fantastical as the typical Kirby-tech Jack used for his science-fiction tales, but compared to this photo below, Jack’s version looks almost like an electric chair. 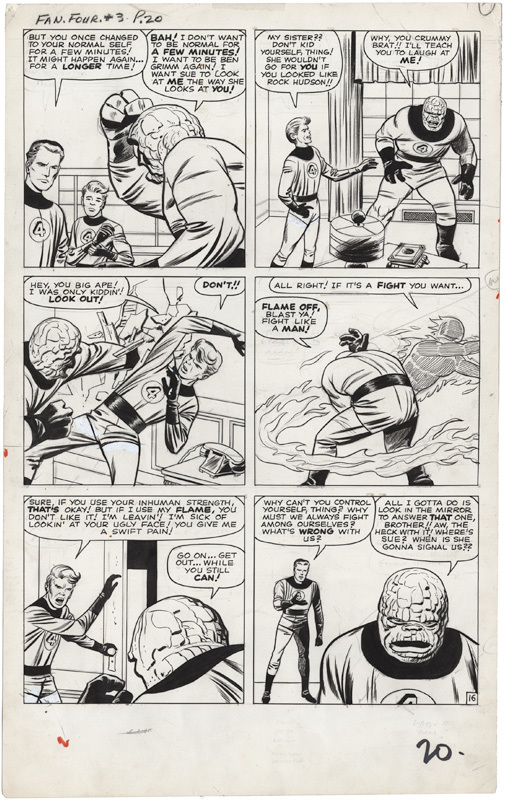 Looking at the artwork below, I find myself wondering how much of Jack’s artwork was inked by Kirby — much of it is credited as Joe Simon inks in the TwoMorrow’s Kirby Checklist because it was just assumed that the Simon/Kirby logo on art meant Jack penciled it and Joe inked it, but it would appear Jack may have been more heavily involved in that end of the process on much of the Simon/Kirby material. Here is the splash for the story “Underworld Snob.” Perfect example of how Jack could create an energetic crowd scene when people are merely walking around. 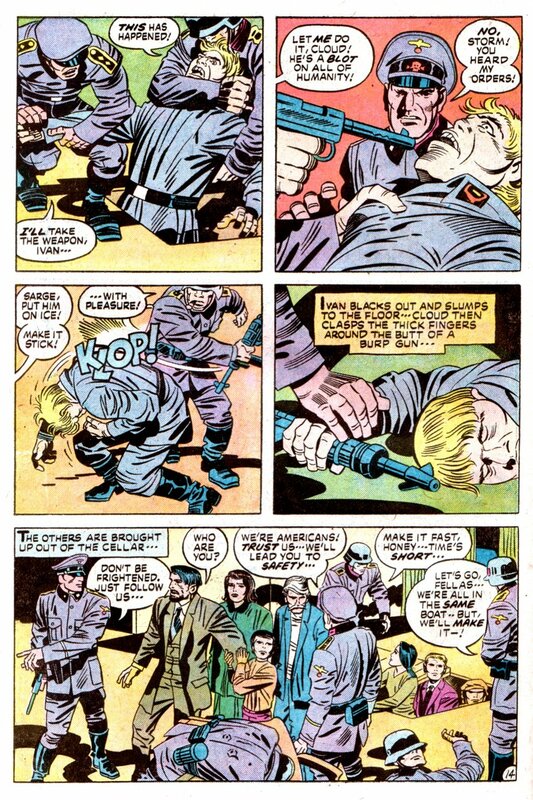 Terrific high contrast comic book pages, showing Kirby had the ability to give you melodramatic, cinematic film noir storytelling if he felt the story called for it. Working on this weblog, I’m constantly amazed by the quality of Jack’s work and the sheer diversity of subject matter he explored seemingly effortlessly. Posted September 23, 2010 in Uncategorized. 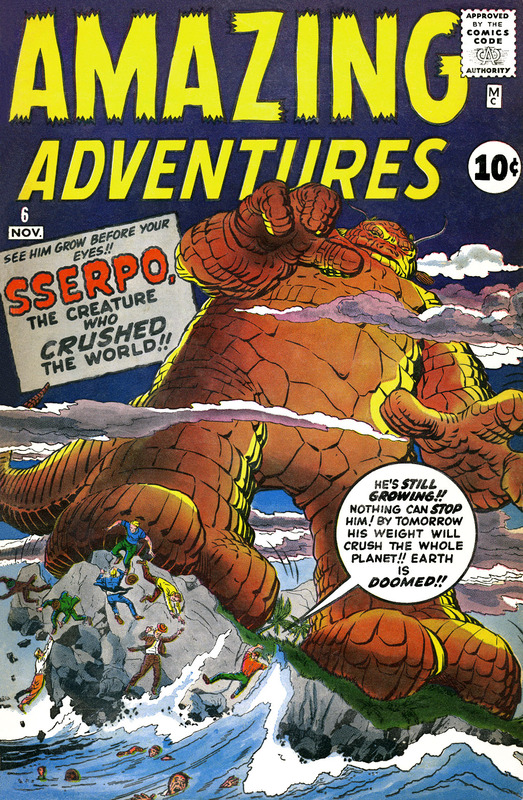 The cover of Amazing Adventures # 6 (Nov 1961) which would be the last issue of that title until it was brought back in 1970. 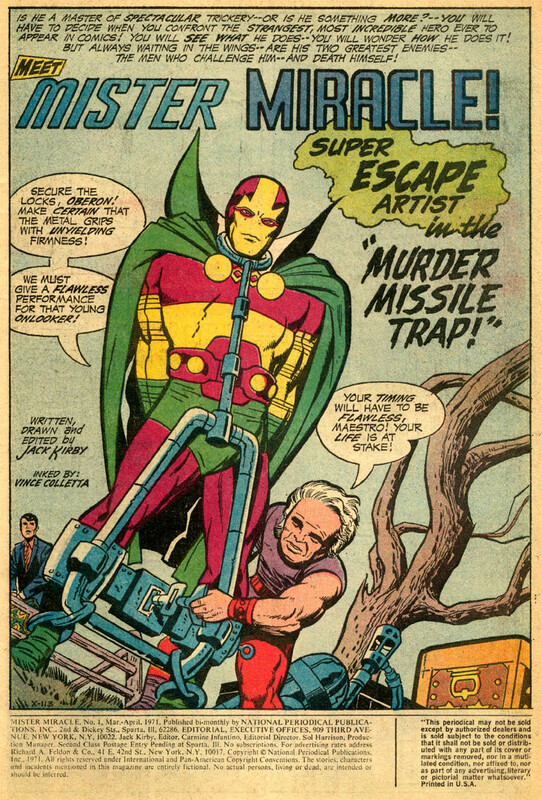 Art by Kirby and Chris Rule. Two awesome chapter splash pages for the story. 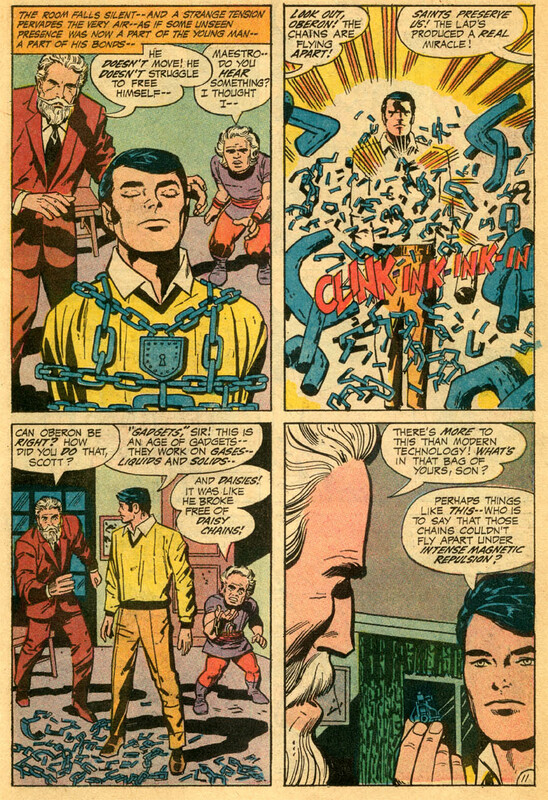 Art by Kirby and George Klein. I think Klein does a solid job on the inks for this tale — the main character is delineated nicely with thick brushstrokes, and the background details are rendered with pen. 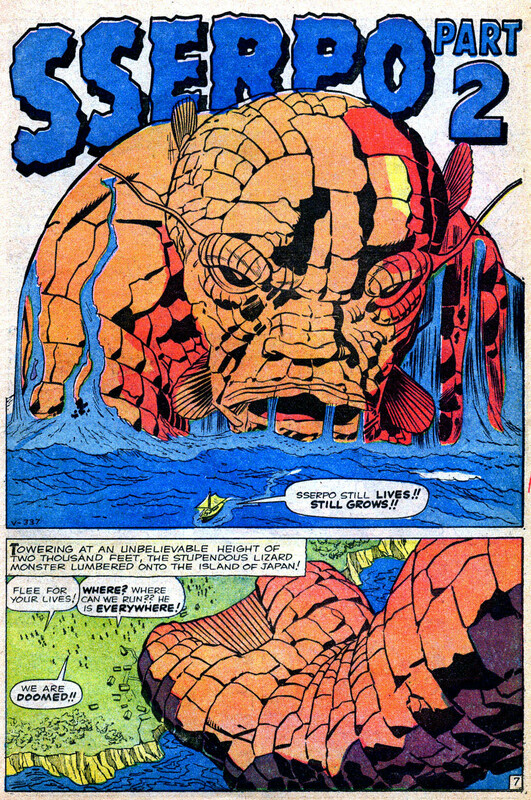 Klein gives the scales of the orange serpent creature a solid three-dimensional quality reminiscent of the famous Kirby/Sinnott shading of the orange rocks on the body of Kirby’s Thing character from the Fantastic Four. 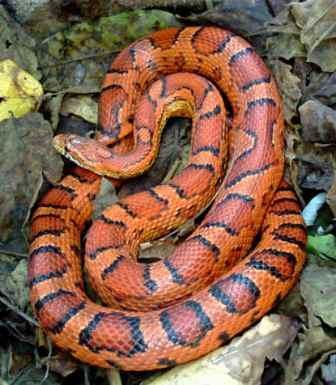 The Sserpo character looks a little more like a lizard to me than a snake — an orange Godzilla. 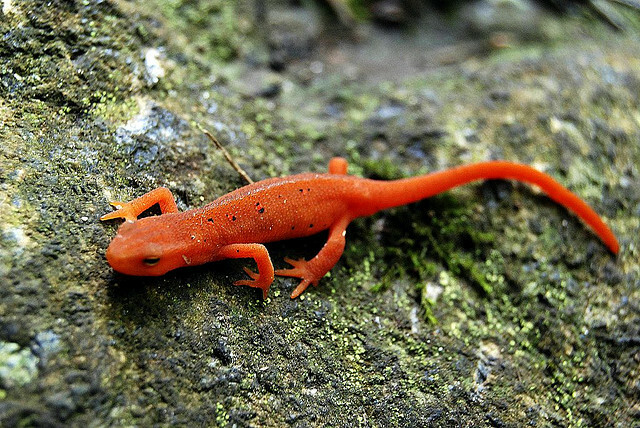 I’ve been living on-and-off in Florida for the last twenty years and although I’ve seen thousands of lizards running around, I don’t ever recall seeing an orange one. 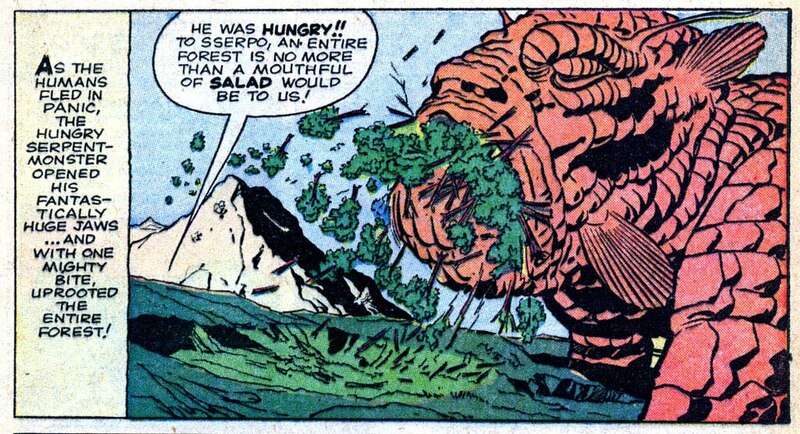 I suppose maybe there are some orange lizards in some exotic place on planet earth, but I bet this is probably an example where Kirby probably assumed the serpent character would be colored green (or maybe he didn’t even think about it) and the colorist might not have read the story and simply chose the orange color because it looked visually interesting. Posted September 22, 2010 in Uncategorized. 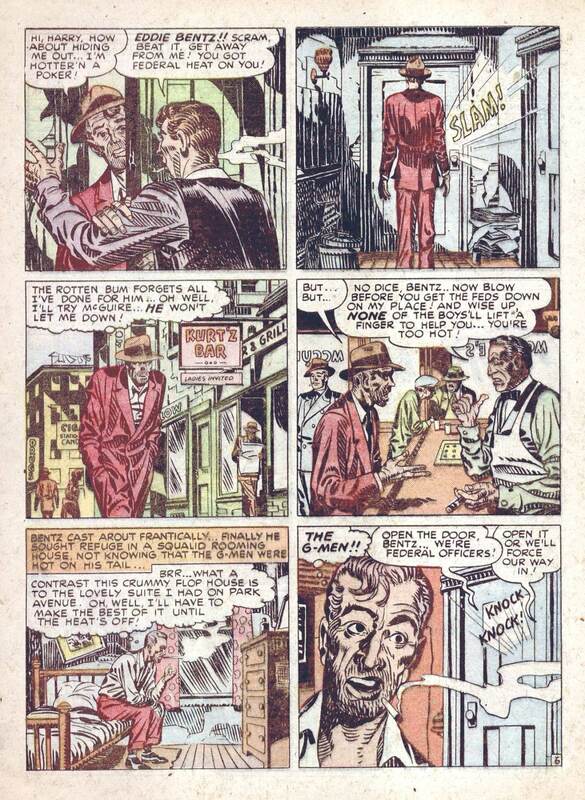 Three pages from “Link Thorne, the Flying Fool,” (not to be confused with Lancelot Link, Secret Chimp) from Airboy Comics # 1 (May 1947), art by Kirby. 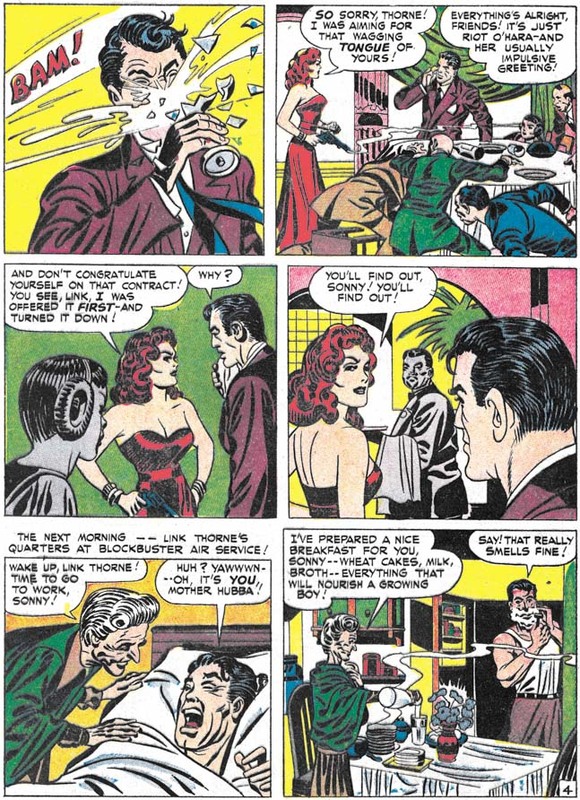 The main character gets a glass shot out from in front of his face in panel 1 of page 4; the red-haired vixen in page 6 is the source of the image you can see at the top of the Kirby Museum website; and great action sequence in the first 2 panels of page 8. Posted September 21, 2010 in Uncategorized. 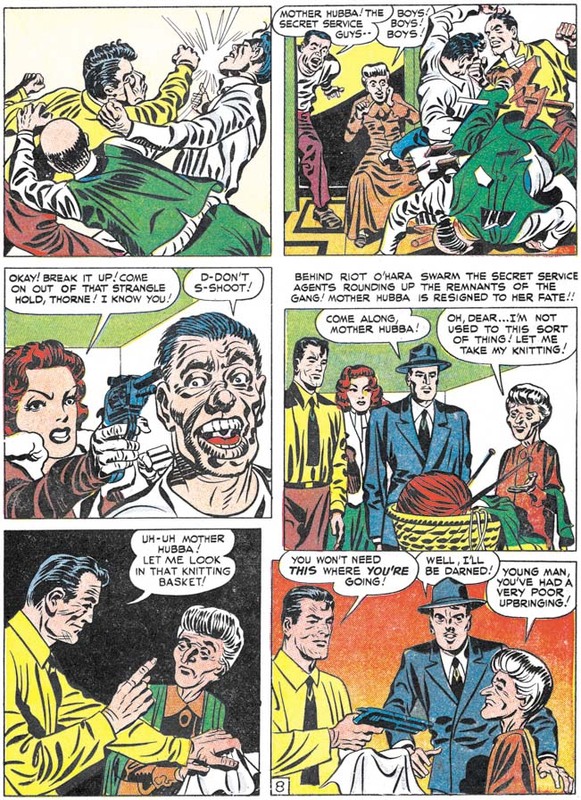 Artwork from Boy Commandos# 3 (Summer 1943). 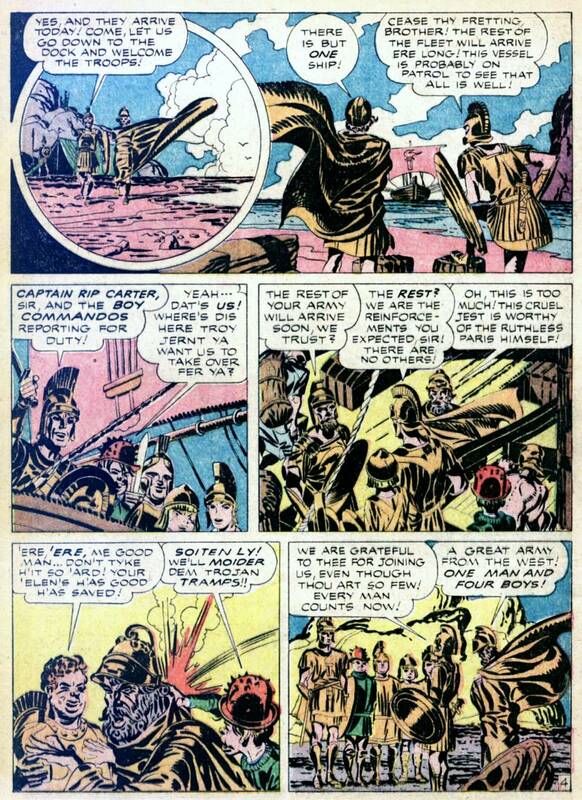 Wonderful period piece by Jack with Joe Simon inks featuring the Trojan War, the premise here being that there have been Boy Commandos throughout history — sort of like an early version of Frank Miller’s 300, only with a little kid wearing a red, spiky metal top-hat. Having characters who are reincarnated through the generations is a great gimmick I’d think artists will use to keep their stories fresh until the end of time. 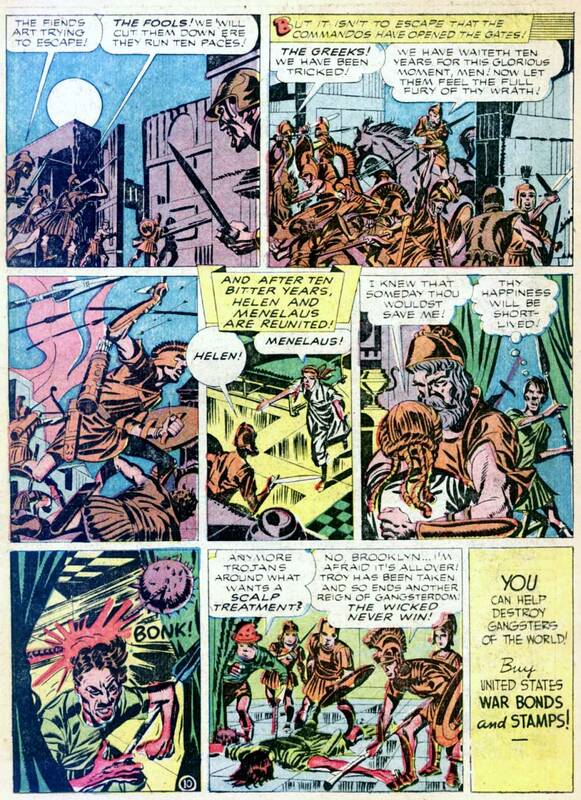 Here are some of the best examples of terrific Kirby art in the story: pages 2, 4, and 10 from the “The Siege of Troy,” featuring the first appearance I am aware of of the Ancient Boy Commandos, and in the last page you can see the Hitler-esque character get what’s comin’ to him. And don’t forget to buy your War Bonds.